David Morrissey is a versatile actor, having performed in an eclectic range of productions for film, television and stage. Born in Liverpool, Morrissey left to study in London at RADA. Most recently, Morissey finished filming the new BBC program The 7.39. Prior, Morrissey starred opposite Mark Strong and Andrea Riseborough in Eran Creev's Welcome to the Punch, and in Rupert Goold's Richard II and in Dominic Savage's improvised drama True Love for the BBC. Morrissey has appeared in some of the most critically acclaimed television dramas, such as Our Mutual Friend; Clocking Off; Holding On, which earned him a prestigious RTS nomination; the six-part BBC political drama State of Play, a role for which he received a BAFTA nomination; and one of Channel 4's most controversial dramas, The Deal, directed by Stephen Frears, for which Morrissey won an RTS Award. In 2006, audiences saw Morrissey in Viva Blackpool on BBC One. Morrissey received the Best Television Actor Award at the Arena Awards, and the series received a Golden Globe Award nomination. Recent television credits include Red Riding, The Field of Blood and South Riding, as well as Thorne: Sleepyhead and Thorne: Scaredycat two films based on the hugely popular Mark Billingham's crime novels for Sky1 in which he played the lead role and also served as an executive producer. His stage work has included a number of productions with the Royal Shakespeare Company and the National, and he has worked with highly regarded stage directors, including Adrian Noble, Deborah Warner and Declan Donnellan. Most recently, he performed in Neil LaBute's In a Dark Dark House at the Almeida Theatre. In film Morrissey has acted in Hilary and Jackie; Some Voices; Born Romantic; Captain Corelli's Mandolin; Miramax's Derailed; Stephen Woolley's Stoned; The Reaping, opposite Hilary Swank; The Water Horse: Legend of the Deep; The Other Boleyn Girl; Neil Marshall's Centurion; Sam Taylor-Johnson's Nowhere Boy and Earthbound. In addition to his acting career, Morrissey founded his own production company, Tubedale Films, which co-produced Patrice Leconte's film L'Homme du Train, starring Johnny Hallyday and Jean Rochefort. 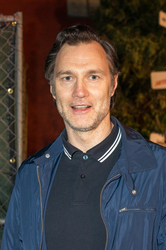 David Morrissey also directed the short TV project Sweet Revenge, the two-part BBC drama Passer By and the feature film Don't Worry About Me.